Don’t Let the Light Go Out. 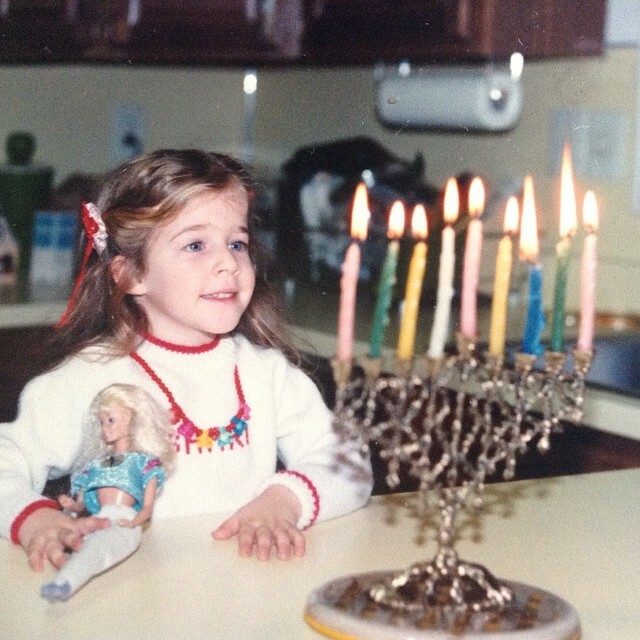 For as long as I can remember, Hanukkah has been one of my favorite holidays. There’s a warmth to it, a peace and joy, that fills my heart and lifts my soul. I have so many wonderful memories of lighting the menorah with my family, holding tight to the rainbow of ridged candles and watching as their flames danced from one to the other. Of spinning dreidels, giggling as they whirled around in a blur of color before tumbling to the floor with one of the four Hebrew letters facing up. Of seeing the smiles on people’s faces as they opened gifts, of excitedly tearing open my own, of gathering around the table during our family party to eat pizza, latkes, and doughnuts. Hanukkah is togetherness. It’s family. It’s love. It’s hope and faith and belief. It’s light. Miracles can happen, if we only believe in them enough. That oil in the menorah so long ago? It was only enough to last for one day, but its flame stayed steady for eight, until more could be found. So often today, we hear about the negative. All we have to do is turn on the television, pick up a newspaper, or scan the headlines online, and it’s enough to knock the wind out of us. This week, especially, the news has been particularly hard to take. And hearing about all these things … well, I don’t know about you guys, but it’s enough to make me want to lock the door and stay inside the house sometimes. But there are wonderful stories, too. Heartwarming ones. There are stories about holiday miracles, like the homeless man who wanted a family for Thanksgiving and got one. Stories about those who dedicate countless time and effort to help others, both people and animals, like the amazing bunny rescue I got Jasper from – they’ve found homes for nearly two hundred rabbits this year! Good is happening out there, too. And no, maybe we won’t all get the miracles we’re wishing for this season, but who knows? Maybe we will. We can overcome the odds with strength and determination. The odds were stacked against the Maccabees all those years ago. Their temple had been seized. They were in hiding. They had many, many battles to fight. But they didn’t give up. They got that temple back and rededicated it. How many of us can relate? We all have our own battles, big and small. We all have our moments of wanting to give up, to give in. But if we keep pushing, keep listening to our hearts and following our whispers, who knows what we can achieve? I’d like to think it’s something far greater than we can even imagine. A little light goes a long way. That light shimmered bright as the stars in the temple, even when it wasn’t supposed to anymore. The flicker held strong in the darkness. Something I’ve learned: for me, that light is my family and friends. It’s the people who offer a hand when I’ve stumbled, the ones who are there for me unconditionally, whether it’s to listen, to give advice and support, or just to spend time together, either in person or via technology. You guys are my light. Is that corny? Maybe, but it’s true. When I’m feeling down, all I have to do is think of the truly special people in my life and it brings back a glow. One light begets another. One flame helps the next grow. One person can help another in such important ways. These are the things I remember when I look at the menorah now. Happy Hanukkah to everyone celebrating, and Chag Sameach! 2. Yogurtland is amazing not only because they have white chocolate Ghirardelli chips as a topping, but also because they have the best flavor ever: Peppermint Hot Cocoa. If you have a Yogurtland anywhere near you, go try this fabulousness. You’ll be glad you did. 3. It is impossible to put eye drops in your own eyes – at least if you’re as squeamish about that kind of thing as I am. Thank goodness for people who offer to help. 4. Wrapping holiday gifts while listening to festive music never gets old. Ever. Cannot wait for the start of Hanukkah tomorrow night and for all the warmth, light, and joy it sends twinkling through the air. 5. Knowing that you’re going to exceed a goal is an incredible feeling. When I first began editing Mine to Love, I hoped to get the manuscript under 110,000 words. With six and a half chapters left to revise, I’m only a few hundred words away. For the first time ever, I’m going to have a book that’s shorter than the goal. This excites me more than it probably should. How about you? What’s one thing you’ve learned this week? A family who loves me unconditionally and supports all my dreams, even when the stars in my eyes seem so far up in the galaxy. Friends near and far, who share their joy and inspiration, who are a pillar of strength, who are the family I choose. Good health, because, truly, that is everything. Loved ones who may not be here in person anymore, but who will always be here in spirit and heart. The chance to watch dreams come true for people I love. Warm clothes, warm meals, warm homes … warmth. A passion for writing which continues to fill me up with every moment, to the point where my love for it just overflows, and the opportunity to live that passion every day. The ability to create stories in my head and allow my characters’ tales to flow from heart to hand to page. The experience of writing books that help me hope and help me heal – Mine to Love is for Sofie, for Brandon, for Ellie, but it is also for me, and I will be forever grateful for how it has changed my life. Characters who have become my friends and their stories that have become part of my own. A writing community that welcomes and supports. Wonderful music, wonderful television shows, wonderful movies, and wonderful Broadway musicals, all of which provide an escape and an inspiration. Beautiful books that invite me into the authors’ worlds, into their characters’ worlds, and resonate with magic so far beyond their pages. Fluffy socks, fuzzy scarves, cozy coats and boots. The Jersey shore, which is always special beyond words and has shown a resilience to be admired since Hurricane Sandy barreled ashore. Steamy chicken soup, delicious hot chocolate, and refreshing frozen yogurt. My laptop, writing journals, and the rainbow of pens that splash color across their pages. The ability to take long walks and enjoy nature’s beauty. The “moments like this” with my favorite singers, favorite authors, and favorite soap stars. General Hospital and American Idol, and the amazing people I’ve met because of them. The extraordinary and the ordinary that’s extraordinary in its own right. The memories we make and the moments we create. A past of experiences that still make me smile and a future filled with limitless possibility. For hope, faith, love, luck, and life. Sometimes you’re fluffy, fresh from the oven and steaming hot. Sometimes you’re chilled from the refrigerator, and that still hits the spot. Sometimes you’re golden brown, shaped into baguettes and rolls. Sometimes you’re a side dish, meant to complement whatever’s in our bowls. Pizza, pasta, cereal, and bagels – without them we’d clearly be out of sorts. But beginning tonight and lasting for eight days, anything with wheat, flour, or grain must be tucked away. Instead we’ll eat matzah, matzah, matzah, the unleavened bread of yesterday. We’ll give thanks for our freedom, and of course our ancestors’ liberty, as well. We’ll recite the Four Questions and declare that matzah ball soup is swell. Moses told the Pharoah to “let my people go” and then he parted the Red Sea. Tonight we honor that by sharing a seder with friends and family. I’ll say ‘adios’ to the delicious confections and embrace the matzah on its stay. But until sundown, pizza it will be. And maybe some ice cream, and cookies, and pretzels – so yummy! Enjoy some leavened foods for me next week. It’ll give you a thrill! Tonight marks the beginning of my absolute favorite holiday, Hanukkah. All year long, I look forward to these eight days and eight nights of light, laughter, and love. There’s something uniquely special about this holiday. Reciting the blessings as a family, lighting the candles and watching as their sparks grow into flames, seeing everyone’s reactions as they open gifts, playing dreidel by the glow of a menorah’s candlelight … it’s the personification of warmth. To me, that’s what Hanukkah is truly about. It’s remembering the miracle of all those years ago – the oil that lasted for eight days and kept the synagogue’s eternal light aglow until more could be brought – and believing in the hope, the faith, the blessings of today. It’s drawing inspiration from those flickering flames and lighting them in ourselves, too. All those years ago, the Maccabees refused to take “no” for an answer. They believed in their synagogue and dedicated themselves to its preservation. No challenge was insurmountable. No mountain was too high. And when the oil did last for an extra week, well, maybe that’s all the proof we need … sometimes miracles really can happen if we only believe in them enough. So, in that spirit, I thought I’d do a holiday version of Tuesday’s Tunes this week. Whatever you celebrate, I wish you nothing but joy. May your holiday season sparkle with magic and be strung with chords of warmth and glitter. “Candelight” – The Maccabeats: This may not be a traditional Hanukkah song, but it is SO GOOD. The Maccabeats have such pure voices, and the way they put this video together is beyond clever. No matter how many times I watch, it always makes me smile. Latkes, dreidels, menorahs, and wonderful music … how better to celebrate this lovely, twinkling Festival of Lights? “All I Want For Christmas is You” – Mariah Carey: Yes, I’m Jewish, but I still love Christmas music! Mariah’s song will always be one of my favorites. There’s an infectious kind of happiness in it, one that makes you want to tap your foot, bop your head, and sing along. It’s a feel-good song, a reminder that the holiday season is a time to let loose, let go, and let be. “My Grown-Up Christmas List” – Kelly Clarkson: This may be a Christmas melody, but its message spans all religions and all people. It’s a reminder of what’s important in life, what wishes so many of our hearts hope for, what this world needs each and every day. There are many versions of this song, but to me, Kelly’s stands out. It’s whimsical, it’s magical, it’s beautiful. And isn’t that what the holidays are all about? Thanksgiving is a day to count our blessings. It’s a day to reflect on all we’ve been given, to be thankful for the moments we create, the memories we make, and, most of all, the people who give them meaning. It’s a day to give thanks for the gifts we hold in our hands and those we hold wrapped in our hearts. It’s a day to choose gratitude. It’s no secret that this year has been unspeakably difficult for my family. We suffered a loss that shadows the sunshine every day, a loss that feels especially strong, especially painful, this holiday season. It’s been a struggle sometimes to work through the pain, and today that’s going to be especially difficult. Couple that with an incredibly frustrating, aggravating, I-feel-like-banging-my-head-against-a-brick-wall experience last night, and you have the recipe for … well, not for what today is supposed to be about at all. A family who loves me unconditionally and gives me the freedom to pursue my dreams. Amazing friends who are the family I choose. Good health – it truly is everything. A passion that fills me up, every single day, with excitement, adrenaline, and pure joy. The opportunity to create whole other worlds in my head and to go on journeys with my characters as they tell me their stories. Important, inspiring lessons learned from so many aspects of the writing, editing, and querying processes. The chance to watch people I care about take leaps of faith and make their wishes come true. A warm house and warm meals. Memories like this and this, from when I worked at the 6ABC Thanksgiving Day parade – a day I will cherish and treasure forever. Vacations to the NJ shore, forever my happiest place on Earth. Great books, great movies, great television, great Broadway shows – all a chance to escape reality and experience a little bit of magic. The chance to meet my favorite authors, see my favorite singers in concert, and attend events with my favorite soap stars. Fuzzy scarves, cozy boots, and brightly-colored peacoats in a rainbow of colors. My laptop. Chicken soup. Milkshakes. The ability to take long walks every day and enjoy nature’s beauty. A future that, while it’s unknown, offers limitless opportunities and a plethora of possibilities. And, of course, all of you!